November 22, 1916 – The first flight of the Royal Aircraft Factory S.E.5. The airplane became an integral part of war during WWI, and the exploits of dashing fighter pilots in their flying machines captured the public’s imagination. Iconic aircraft like the Sopwith Camel and Fokker Dr.I Dreidecker came to symbolize the airwar and, as two of the top performing fighters of the war, they remain fixed in our memories and have even found a place in popular culture (Snoopy “flies” his Sopwith Camel doghouse against the Red Baron flying a Dreidecker). But, just as the Supermarine Spitfire overshadowed the workhorse Hawker Hurricane in WWII, the Camel overshadowed its stablemate, the Royal Aircraft S.E.5 (Scout Experimental 5), though both aircraft worked together to gain air supremacy over the Deutsche Luftstreitkräfte (German Air Force). Unlike the Camel, which was powered by a heavy rotary engine spinning at the front of the fighter, the S.E.5 was developed by Henry Folland, John Kenworthy and Major Frank Goodden around the new, water cooled 150 hp Hispano-Suiza 8 which turned the propeller through a series of gears. The stationary V8 meant that the S.E.5 didn’t have the weight and torque of an entire engine spinning at the front of the plane, and that helped the S.E.5 to be a very stable aircraft to fly, particularly in the hands of inexperienced pilots. It also made it a superb platform for gunnery. But even though the S.E.5 2 was known for its stability, it was still a solid dogfighter, and while it couldn’t quite match the Camel in a tight scrap, the S.E.5 outperformed it at high altitude, and was more effective against the Fokker D.VII when it arrived over the battlefield in 1918. The Royal Aircraft Factory built three prototypes at their Farnborough factory, but two were lost to crashes, one of which claimed the life of Royal Aircraft’s chief test pilot and designer Frank Goodden. The cause of the crashes was traced to problems with the wing construction, so the S.E.5 was redesigned to strengthen the wing, resulting in one of the most rugged designs of the war, and giving the S.E.5 particularly good strength in a high-speed dive. S.E.5a during WWI. A wartime censor has obscured aircraft serial numbers in the photo. November 22, 1898 – The birth of Wiley Post. The period between the World Wars, roughly 1919 to 1939, is called the Golden Age of Aviation. During this period, fabric-covered biplanes quickly gave way to metal monoplanes, and barnstormers crisscrossed the United States, sparking a fascination with flying. Aviation ceased to be an entirely military affair as more and more civilian pilots took to the skies, and larger-than-life characters began pushing the boundaries of flight ever farther as they strove to set records in altitude, speed and distance while further advancing aviation technology. One of those characters was Wiley Post, who was born in Van Zandt County, Texas and first became fascinated in aviation at the age of 14 when he saw his first airplane at a county fair. With the outbreak of WWI, Post enlisted in the US Army Air Service, but the war ended before he could finish his training, and he went back to work in the oilfields of Oklahoma. At the age of 26, Post finally took to the skies, not as a pilot, but as a daredevil parachutist for a traveling flying circus. When an oilfield accident caused the loss of his left eye, Post used the money from the accident settlement to purchase his first airplane, and he became the personal pilot of a wealthy Oklahoma oilman who purchased a Lockheed Vega and named it Winnie Mae after his daughter. Flying the Vega, Post put his first mark in the record books with a victory in the National Air Race Derby from Los Angeles to Chicago, completing the flight in just over 9 hours. But still greater fame lay ahead. 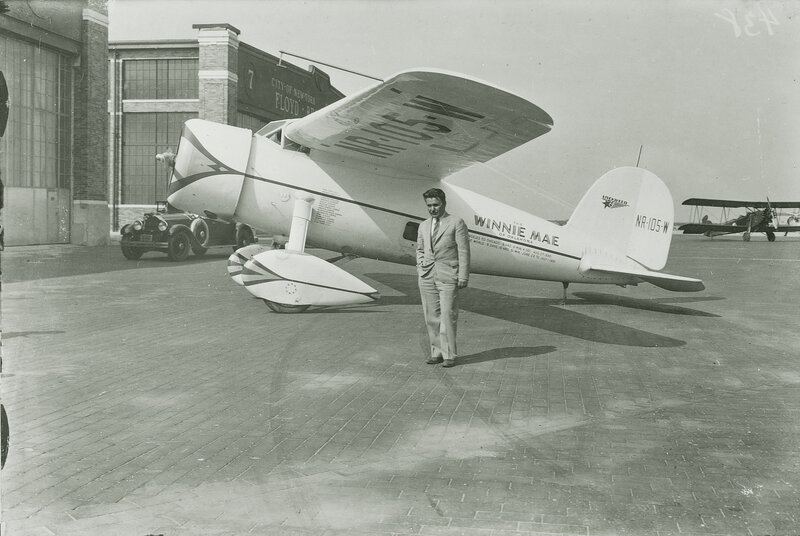 On June 23, 1931, still flying Winnie Mae, Post and his co-pilot Harold Gatty set out from Roosevelt Field in New York for a flight around the world. The pair headed for Canada, then over the British Isles and Europe, then over Russia and on to Alaska, then across Canada and back to New York. The flight covered 15,474 miles and took them just 8 days, 15 hours, and 51 minutes, slashing more than 12 days off the previous record set by the Graf Zeppelin (LZ 127) in 1929. They returned to a ticker-tape parade and lunch at the White House with President Herbert Hoover. But records in the 1930s were meant to be broken, and Post broke his own circumnavigation record three years later, but this time, he did it alone. On July 15, 1933, Post took off from Floyd Bennett Field in New York, once again piloting Winnie Mae after using the intervening three years to upgrade the aircraft with an autopilot and radio direction finder. Covering roughly the same route as before, Post broke the record he set with Gatty and finished the flight just 7 days, 18 hours, 49 minutes. In an era where feats of aviation still garnered the attention of the world, a crowd of 50,000 thronged the airfield on his return. Not content to rest on the laurels of broken records, Post was also an important innovator in aviation technology. In an era before pressurized aircraft, he helped develop the first pressure suit for pilots, and reached an altitude of 50,000 feet, discovering the jet stream along the way.